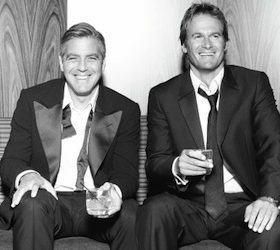 Shots all around as George Clooney and two co-owners rake in the dough after selling their Casamigos tequila company. How many shots of tequila can one billion dollars buy? George Clooney can possibly get a round for every person of legal drinking age in the United States after his tequila company, Casamigos, was sold to spirits giant Diageo in a deal that could be worth as much as $1 billion, reports CNBC. Co-owners Rande Gerber and Michael Meldman benefit from this windfall as well. Read more about reposado Tequilas, including a review of Casamigos. Find out how high of a rating it got.